I’m reading a draft of Jim Shore and Shane Warden’s Art of Agile Development. So far, it’s fantastic, packed full of juicy tricks of the trade. I’ll be giving a copy to every team I work with, I’m sure. Steve Hayes writes that Scripting for Testers “has the clearest explanation of regular expressions that I’ve come across.” Assuming it’s not the only explanation he’s read, I’m immensely pleased. I think regular expressions are terribly important for my intended audience*, and I was worried my explanation wasn’t good enough. Guess it’s time to start that Erlang book. 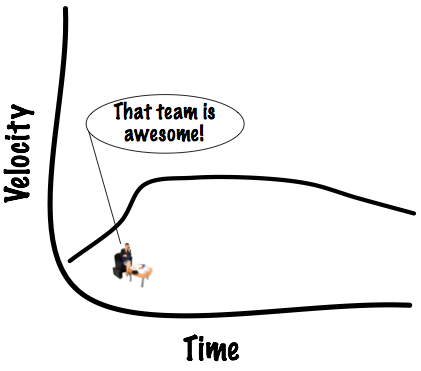 I find myself advising new Agile teams to go slower than they could. Here’s the thing: at the beginning, they’re probably working on a bad code base, and they have yet to learn important rules and habits. They will find it easy to go faster than is compatible with making the code more malleable. Now, a bird in the hand is worth two in the bush, a euro today is worth more than a euro tomorrow, and a rational actor might be justified in preferring the first curve to the second. However, the novice teams I coach are in places that have already paid the price for going too fast, so that argument probably does not apply. We don’t need post-agile. 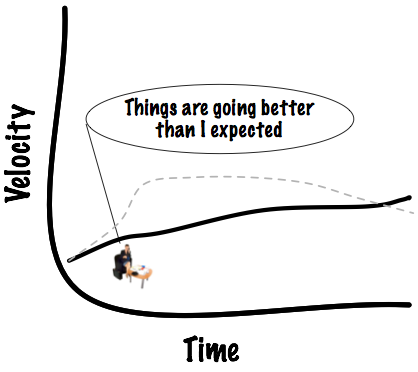 We need pre-agile. More later. I’ve been asked to post a pointer to the first Czech Ruby / Ruby on Rails conference. It would be fun to go, but I surely won’t make it. You can, though. I’ll be giving the keynote at this year’s XP Day Toronto. Six Years Later: What the Agile Manifesto Left Out. The Agile Manifesto has worked rather well at changing the way software is built, but the Agile movement is now suffering from some backsliding and some backlash. I believe that’s partly because the Manifesto is almost entirely focused outward: it talks, to the business, about how the development team will interact with it. What it does not talk about is how the team must interact with itself and with the code. In the early days, that didn’t matter so much; the right interactions tended to happen anyway. But now it matters. In this speech, I want to talk in some detail about what got left out. A successful Agile team is a complicated web of… things: people, practices, tools, and so forth. Some of them are well-documented, some not. Even for those that are documented, Andrew Tannenbaum’s motto applies: “People need more often to be reminded than informed.” As more and more Agile teams form, the need for both reminding and informing is increasing. I am going to write a document called “The Mechanics of Business-Facing Automated Tests”. I’ll be posting drafts of the different chunks here, hoping that you’ll help me improve it. I’m interested in improvements to the ideas and the flow of explanation rather than line-by-line or word-by-word improvements. Thanks. The sample application is only a realistic sketch. It pretends to be the server part of a system used by travel agents. For my own convenience, I wrote the application in Ruby, but I’m treating it just as I would were it in Java. The tests are written in Ruby for the reasons I gave earlier. In normal use, the application is a server that communicates with a client and with airline servers. The server communicates to the client via XML messages over a network. To communicate with airline servers, it drops files on disk to be picked up by FTP. Airline servers deliver files in the same way. 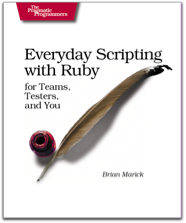 I’m not the only person thinking of writing Fit-like tests in Ruby. Zenspider had the same idea first.